American bedding retailer Casper is at the forefront of experiential retailing with their innovative sleep bar. Nestled in the middle of bustling NYC, Casper’s the Dreamery is a go-to hideaway for the city’s busiest, who, desperate for some shut-eye, can stop by and pay $25 to have a 45-minute nap in this little nook. Founded in 2014, the retailer behind the genius idea, Casper, is all about ‘reimagining’ how the world sleeps. With a vision to lead the way in innovative bedding products, the retailer founded the Dreamery in a bid to improve the wellbeing of residents in the city that never sleeps. 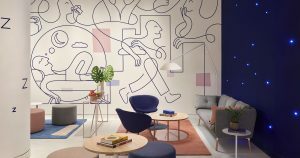 The hub offers residents a chance to escape the hustle and bustle of New York with some R & R, all while experiencing Casper’s latest collection of sleep products. Fitted out with a starlit entryway and murals and individual sleep nooks which feature complimentary pyjamas and Casper’s custom mattresses and sheets, the Dreamery offers an escape from the rush of city-life. With complimentary beverages, pyjamas, amenities and special sleep audio all available, the Dreamery is all about giving customers the best possible experience, even offering various workshops on sleep and wellness. The retailer is leading the way in experiential retailing, promoting sleep wellbeing whilst also giving customers a chance to try their innovative bedding collection. “The Dreamery is about making sleep and rest a part of our regular wellness routines — similar to how many people prioritize a workout class,” said Neil Parikh, co-founder at Casper. Buy now pay later: fad or future?